"All it would take is one or two big storms and these houses you see behind me would be gravely at risk." Climate change is at Sandy Adam's door — literally. He lives in Tuktoyaktuk, N.W.T., a community of about 1,000 people on the shores of the Arctic ocean. Adam lives in a four-bedroom home with 13 other members of his family in The Point — a picturesque spit overlooking the ocean. The trouble is, the land behind his home is being eroded away by the ocean. Now there's less than a metre between his house and the water. He knows he has to move but it's hard leaving his home where he watches the whales go by. "These two months are going to be a little bit hard I think because it splashed my window when we started getting west wind," says Adam. Four houses were moved last winter. This winter, Adam's and three others have to move. It's something Mayor Darrel Nasogaluak says needs to happen soon. "You can see big cracks in the ground where the ground is shifting and thawing. This area washed out last year, we had two or three big storms and you can see one of the foundation pads that fell over," Nasogaluak explains. "The erosion here was really happening fast last year. All it would take is one or two big storms and these houses you see behind me would be gravely at risk." 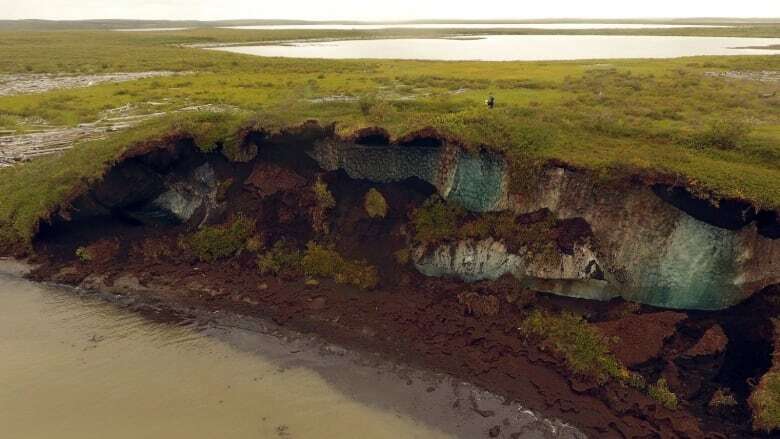 Erosion has been a fact of life for Tuktoyaktuk residents for many years now. The school, RCMP station, fire station and community hall have all been moved because of it. But over the last few years, the erosion rate has quickened to 2.1 metres a year. Which is a lot for a community like Tuktoyaktuk but more remote coastlines are experiencing an even more dramatic change. 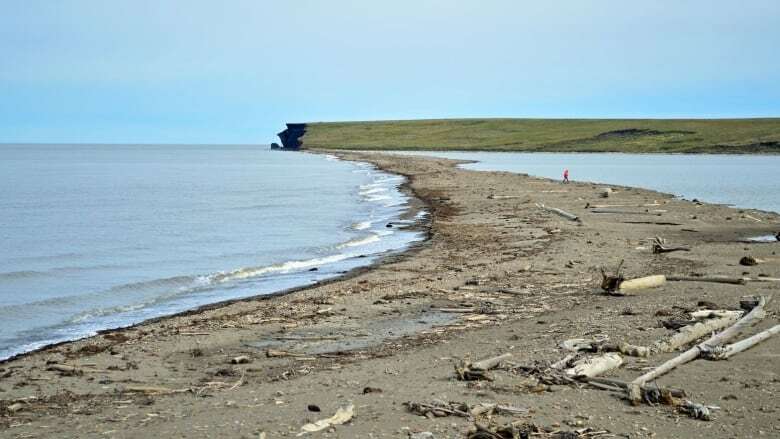 Pelly Island is an uninhabited Island northwest of Tuktoyaktuk. Scientists have been tracking the erosion and estimate the coastline is washing away at a rate of 30-40 metres every year. 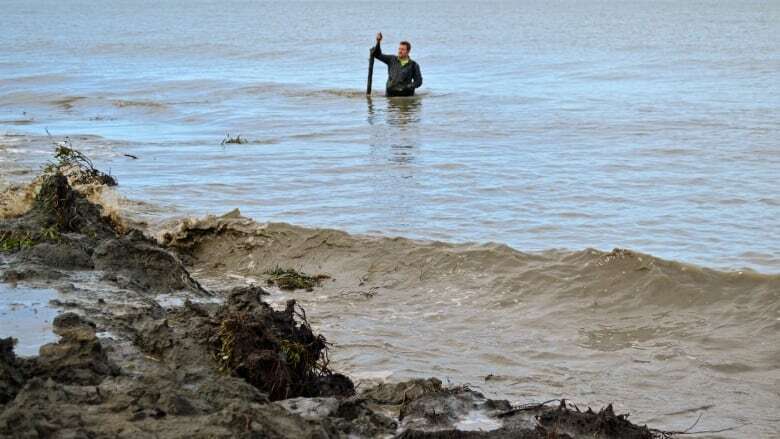 Scientist Dustin Whalen,with Natural Resources Canada, is one of the people trying to document how quickly the shoreline is disappearing. "For years now, we've been coming to Pelly Island, trying to catch this footage on a time-lapse camera. This is our third year trying and our third year failing," says Whalen. Each year, they've set up a camera in an area they think is stable and each year the camera has washed away. Now they have to rely on drone footage and historical photos of the island. "We can't predict how the island will change," says Whalen. According to Whalen, there are two things happening which make the erosion so pronounced on Pelly Island. First, the permafrost is melting, so the water from melting ice is flowing into the ocean. Second, the warmer temperatures mean that the ice freezes later in the winter and breaks up earlier in the spring — leading to more open water and more storms that batter away at the coast. He estimates this island could disappear completely within 50 years. Scientists are still studying what impact all this sediment has on the ocean and the fish and mammals that live there. As for the people in Tuktoyaktuk, they've learned to live with a moving coastline. "It's been 30 years that the community has been adapting to it," says Mayor Nasogaluak. Listen to the full conversation with CBC's Briar Stewart at the top of this web post. This segment was produced by The Current's Liz Hoath and CBC's Briar Stewart.